You can set up the projector to send you an e-mail alert over the network if there is a problem with the projector. Select the Notifications menu and press Enter ( ). Enter the IP address for the SMTP Server setting. Note: Do not use these addresses: 127.x.x.x or 224.0.0.0 through 255.255.255.255 (where x is a number from 0 to 255). Select a number for the SMTP server Port Number setting, from 1 to 65535 (default is 25). Enter the sender's email address as the From setting. Choose an Address field, enter the e-mail address, and select the alerts you want to receive there. Repeat for up to three addresses. Your e-mail address can be up to 32 alphanumeric characters long. 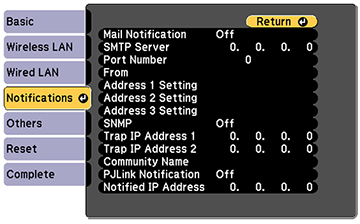 If you are using the PJLink protocol for projector control, turn on the PJLink Notification setting and enter the IP address where you want to receive PJLink notifications as the Notified IP Address setting.